Okay, this book was absolutely AMAZING, and it almost made me cry many, many times, despite the fact that it is a fairly short book, but first of all, I have a rant. One which I am sure is not remotely original, but one which I must nevertheless make. Now look at the first cover again, which is the UK paperback version. And now look back at me. I am not pleased with the UK paperback version. The US hardcover version is making a statement that fits in perfectly with the message of the book. 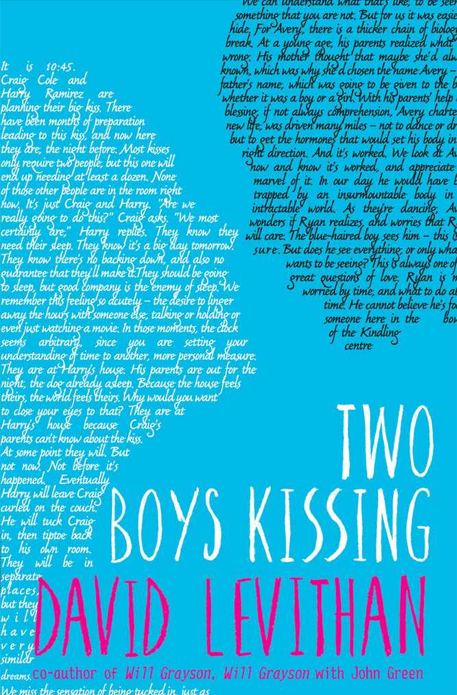 Look at that title and that beautiful image and how in your face it is: two real, live boys kissing, their faces filling up the entire cover. That gigantic title just slammed right on top of the image. You can't ignore it. The visibility is precisely the point. The UK paperback version is just so feeble and bland in comparison. THEY'RE NOT EVEN KISSING. Nor are there actually any boys. Just some silhouettes made out of words. Nothing about the cover is eye-catching. However, I'm here to talk about the actual book, and the book itself is wonderful. It's my new favourite solo Levithan, and it's one of my new favourite books ever. There were many times, especially towards the beginning of the book, when I had to blink away tears. In fact my eyes were constantly filled with tears for maybe the first 10% of the book. I was mesmerised by the voice of the chorus of those who have died from AIDS. Reading their perspective on life was simply so crushingly beautiful, infinitely sad and exhilarating all at once. All the things that they've been through, and all the things that they will never have again. Their pain and happiness, their memories of illness and love and family and friendship, freedom and secrecy. What they think about the lives of teenage boys now. I love the different stories of gay teenage boys that we get in this book. Craig and Harry, who used to be boyfriends but are now best friends, trying to kiss continuously for over thirty-two hours. Peter and Neil, who have been in a relationship for over a year. Avery and Ryan, who are just meeting each other for the first time. Cooper, who is so alone and struggling to feel anything but emptiness. Boys whose parents are accepting and boys whose parents aren't, boys whose parents are trying to get there. A boy who is transgender. Another boy who is suicidal. They're all very different, and I feel like all their stories were realistically and sympathetically portrayed. They all faced real difficulties, whether big or small. The characters and their relationships all felt incredibly authentic. I liked that the glimpses we got of them felt like real life. The sense that their stories weren't in anyway complete, that these were just brief snapshots of them; that their lives had so much potential, and their futures had so much power. That not everything is easy, and not everything is triumphant. But they are alive. This book has so much to say about love and family. It is a book which reaches out to you with every word and tells you that you should live, and love to the best of your ability. I could quote so many lines from the book which meant the world to me, but I think it's best if you read this book and discover them yourself. I can't tell you how much it felt like this book understood me profoundly. Like it was holding my hand. Such a fantastic review! I enjoyed Two Boys Kissing, but not as much as you. I had a hard time connecting emotionally to the characters because of the way it was told, but it's still such a powerful, important and thought-provoking novel. Probably one of the most important books I've read. I'm with you; not a fan of the UK cover for this, or the UK covers generally. There was a real chance to be bold there, and they chose to fit it with the others. I can understand that, but god! The US cover does exactly what the two guys are doing - making a statement! Thanks for the review! I found that with this book, I didn't feel like I necessarily had to connect with the characters the way I do with other books; it didn't detract from my enjoyment of it. I felt like in a way I was supposed to feel a little detached from them, the way the Greek chorus is; the reader is just a bystander catching glimpses of their lives, and I loved it for what it was. But I can see how others might view this as a flaw. I'm so sad about the cover redesigns. ): ): They all look so vague and forgettable. I liked it (a LOT :) The story and characters felt so real and like you said "authentic". Definitely glad that I decided to read it.